This page compares Microwave heating oven vs solid state RF energy heating oven and mentions difference between Microwave heating oven and solid state RF energy heating oven. Solid state cooking is going to take over microwave cooking due to its several benefits. We are aware of traditional microwave oven used for cooking based on microwave heating. This cooking appliance works based on device called magnetron. It couples with antenna mounted inside the closed cavity. Here excitation frequency inside the cavity is fixed and can not be varied. Solid state cooking oven replaces magnetron with synthesized signal source along with PA (Power Amplifier). Here frequency, power and phase of excitation frequency can be varied. The figure-1 depicts solid state oven with core systems. RF frequency starts from much lower value compare to microwave frequency starting range. heating effect Heating is non-homogeneous and hence food gets cooked on top layers and does not get cooked in the middle part. Heating is homogeneous and hence food gets cooked equally from all the sides. Variation in frequency/power Not possible Possible, frequency, power and phase can be controlled so that electro-magnetic fields are bombared at various positions in the cavity as desired. 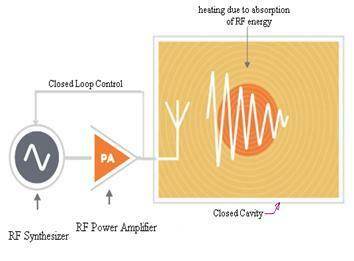 Frequency sweep Not possible, fixed RF frequency source is excited. Possible with the help of synthesized source. Fine control of cooking Not possible possible hence both veg and non veg food can be cooked together. Conclusion: Solid state RF energy heating has many benefits over traditional microwave heating due to which it is going to be future technology for quality cooking. It can also be used for various applications including automotive ignition, drying, tumor ablation and plasma lighting etc.